I knew about Skritter for some time now, but never really got around to actually checking it out. After Sara’s recommendation I couldn’t resist anymore and signed up for the trial. Another factor was that the lab that I’m working in now had a Wacom Bamboo tablet lying around. I installed it and never looked back. I’ve used Anki before as a way to learn some extra vocabulary while I study. Now that I don’t have formal class anymore, I needed to find a way not only to pickup new words, but keep the old words there. Skritter not only helps me learn words, but it helps me write them. My Chinese writing usually occur on the PC, but I love writing Chinese characters, but sometimes I just can’t find the proper motivation. Skritter offered me that. One thing that I noticed with Skritter is the ease of use of the program. I immediately understood everything. I’m currently learning to write HSK 1 & 2 again. Most of the words I know, but forgot how to write. Those lists are there, ready to be learned. Secondly, I found using a kinesthetic way of learning vocabulary a refreshing method to other SRS programs. Using a tablet itself is more active and does not feel as boring and monotonous as other SRS programs. 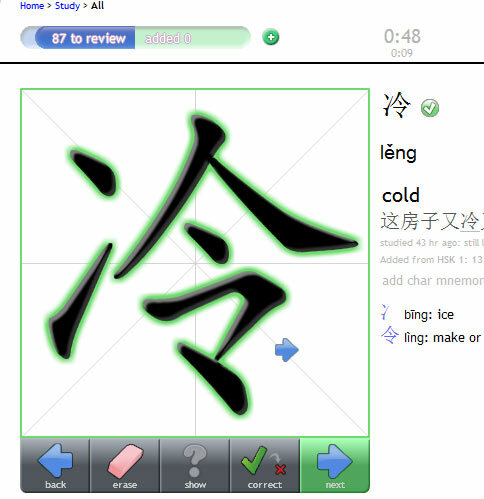 I highly recommend Skritter not only as an SRS alternative, but as a great way to learn how to write words (I’m finally training myself proper stroke order), but as an all inclusive Chinese learning program for tones and definitions as Skritter handles all those aspects as well.